This site is about my story, and how and why I think there are lessons in what I have experienced, worthy of sharing in the hope that people might find them of value. But before I get too deep into the how and why, I think a simple overview of my journey is important for context. Maybe some of my story will sound familiar. No one’s journey is the same, but elements might resonate, and certainly the lessons I learned, and the obstacles and challenges I encountered may just help you avoid them. The year was 1998. I was coming to the end of my six years of high-school, so it was time for University. It was never really up for discussion, or debate, it was just the next step for me. It seems crazy now, but I was fairly immature, yet finishing high-school at 17 is pretty young, now reflecting back, having to catch public transport or get a lift from my parents to the first semester of classes, really hammers home the point as to how unprepared I was. Coupled with that, I’d enrolled in an ‘Arts’ degree. To me, it was simply the closest thing to resemble a random collection of high-school-looking subjects, allowing me to simply coast on, with no real understanding of the reason to go to University. I spent three years, graduated with a major in Sociology, and left before I was 21, so uninspired that I didn’t attend my graduation, or leave three full years of study with one friend, colleague, or acquaintance in my network from the time. Fine by me, I thought. That’s out of the way, now it’s time to live. But where to from here? I don’t know, my parents will tell me I guess. My youngest sister just turned 21, and is one of the main reasons I’m writing this. She is still at University, but despite doing extremely well at high-school, seems to be in a similar boat to where I was, doing University because that’s what you have to do, not really chasing the degree for any other reason than, it’s the right thing to do. This is not about University being the wrong thing to do, or about anyone’s specific life choices, in fact University was the perfect thing for me to do, the second time around. If you are passionate about what you are studying and have even a minimal understanding as to why you are studying it, and feel inspired enough to implement some of the ideas in this blog about maximising your time, grasping your opportunities to immerse yourself in your passion – it can be terrific, not just terrific, but life-changingly fantastic. I know because I’ve lived it. Of course, many significant experiences were had between these milestone markers below, and by the time the ‘do-over’ approached, (my second time around at full-time tertiary study) my creative side, my authentic self was shining through in a variety of ways. But just not my main focus, yet. 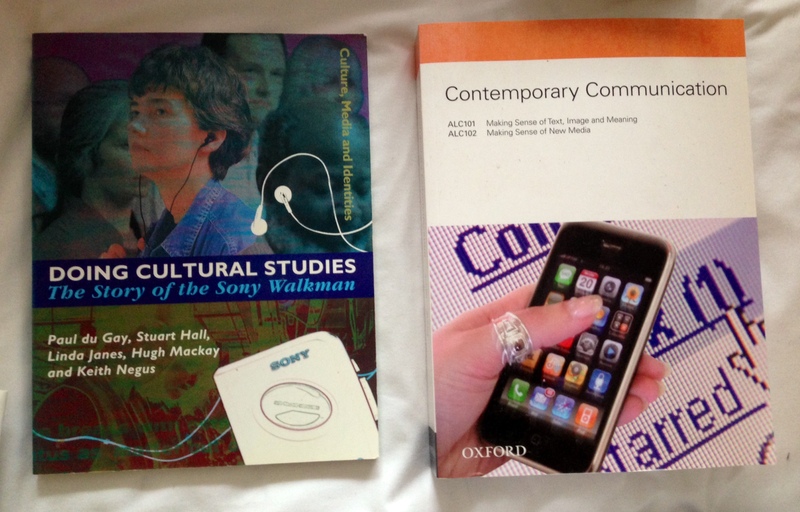 The difference between between the world in 1999 and 2009, summed up on the cover of the university text books I used. The Sony Walkman, and the Apple Iphone.